The call came at 9:37 Saturday night, December 8. I was just settling into to my normal routine of consolidating the organizing point of the gospel message for Sunday. Faith Lutheran’s president Jane Wiley was on the phone. It was a 35 second call: The church is on fire. How did you find out? Fred called me. How did Fred hear about it? The sheriff’s office called him… I’m on my way. Sheriff deputies blocked access to the church but waved me through when I identified myself as the pastor. It was 10 pm. Soon leadership from both Faith and our sister congregation St. Paul arrived. The fire was already extinguished. A deputy sheriff asked me a few questions and then the fire inspector. We stood at a distance as we watched the fire department complete their work. 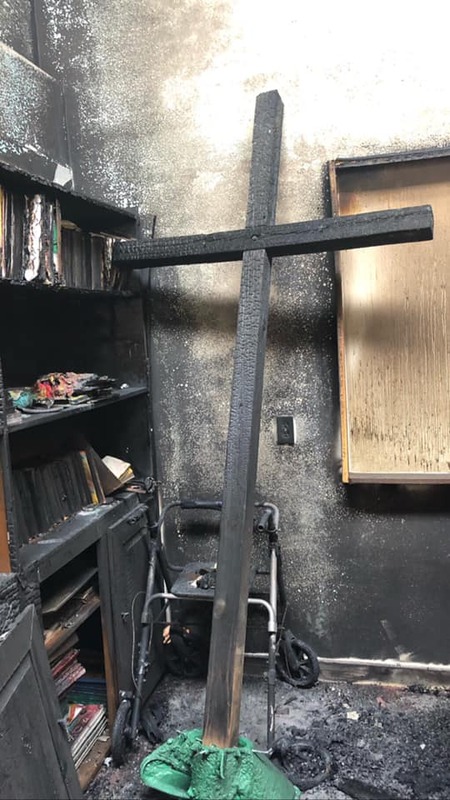 The initial impression was an electrical malfunction in a security light ignited the dry exterior wood, and then fire ran up to the roof and set the acrylic skylight that runs the length of the sanctuary aflame. When the fire department had cleared the area, we went in with flashlights and the camera lights on our smart phones. The acrid smell of smoke was heavy and soggy ashes covered the floor. We formed groups to pull hymnals and move the Wurlitzer and Spinet organs. Then we nailed the front doors shut, since the fire crew had busted them open for entry. Firefighters extinguished the blaze in 12 minutes, but we’re on a 12-month journey – or more. That Sunday required us to run extension cords from our daycare center to the Fellowship Hall. We immediately had to hire an electrician to restore power to the Fellowship Hall, since most of the power for the campus runs through equipment in the sanctuary. With no small amount of cajoling, the electric company restored power to the campus the Saturday before Christmas. The news coverage brought us a lot of attention and well-wishes poured in. We are so grateful for the prayers, assistance and offers of help. Faith Church will draw on them as we proceed. The Way Church, a new African American ministry sharing our space stepped up and helped raise funds through a GoFundMe account. A former member heard my Christmas plea for containers and immediately sent two over from her business. 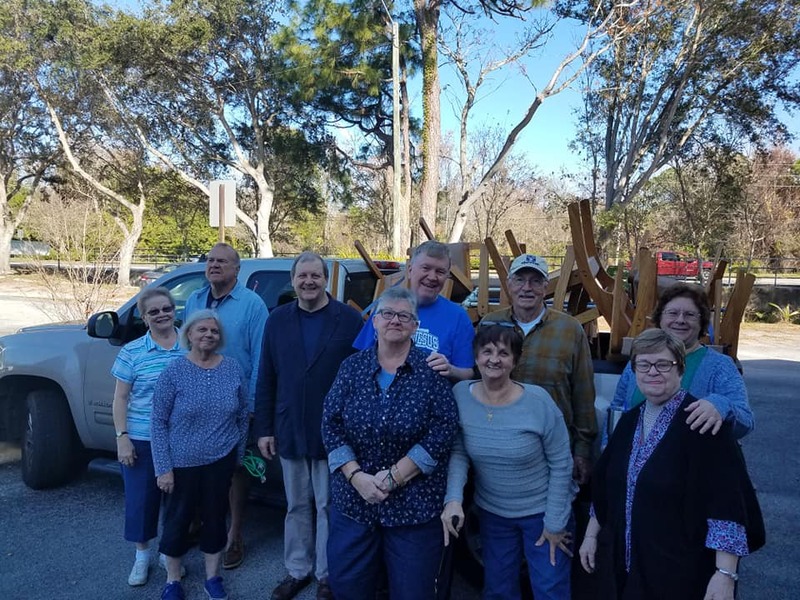 On the Thursday after Christmas, some 30 volunteers showed up to help us clean out fire debris and move items into storage. St. Matthias in Clearwater is selling its building and gave us worship furnishings which we picked up last week. 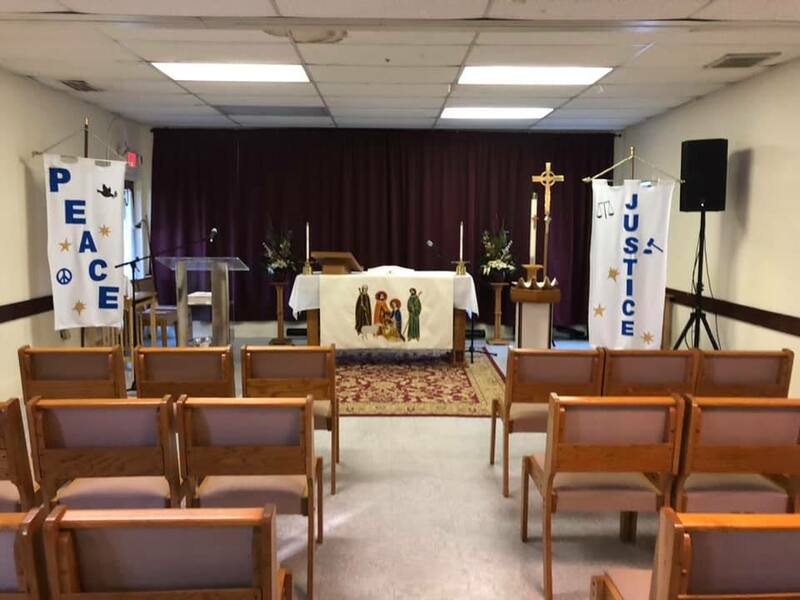 They dressed up our Fellowship Hall to look and feel more like a sanctuary. The initial insurance inspection the week of the fire led the insurer to call for an origin and cause determination. We waited a couple of weeks for that. The finding: the bracket that held the security lamp broke and the halogen lamp touched the plywood siding, igniting the fire. Meaning: the fire is a covered event. Next the adjustor and structural engineer were to come out. Five weeks after the fire, they arrived. The immediate impression of the independent adjustor is the sanctuary will be demolished. The engineer took pictures and measurements and said he would have to research the issues around the charring on the structural beams and wood decking. So we still wait. To date the insurance company has not sent any funds. The special donations to the Faith Fire Fund, in-kind goods, and helping hands have kept us functioning. 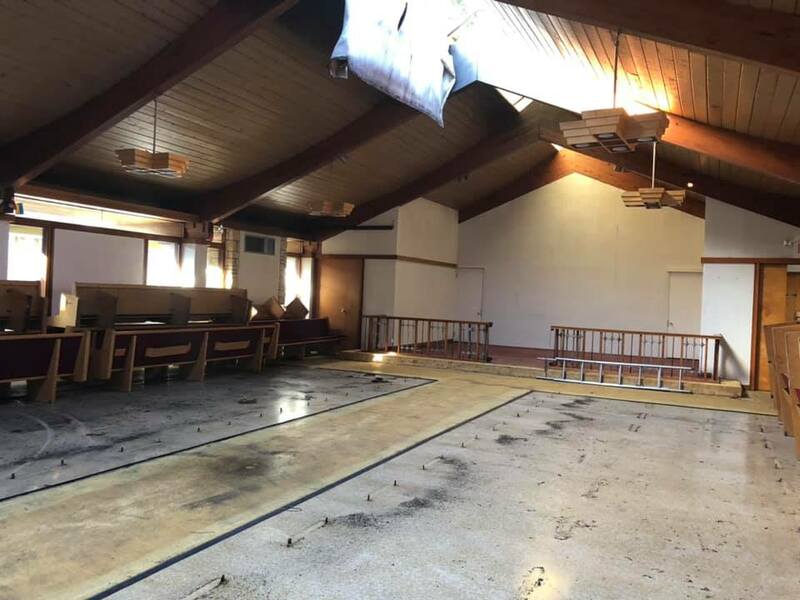 Going forward, we’ve lost the monthly income from the mission church that was using the sanctuary. Faith Church lacks another space to accommodate them. Contributions through our website (faithtampa.org) or the synod webpage are needed. The church is people who love God, support one another, and serve the community. No fire damages that. 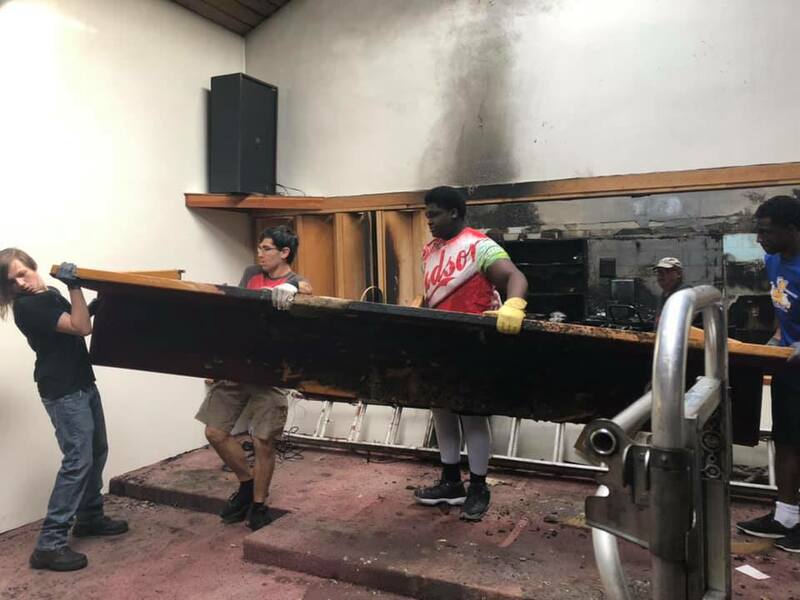 The help we received underscored my answers to the news reporters who asked me about the damage the fire did to the church. My response: The church is people who love God, support one another, and serve the community. No fire damages that. But our sanctuary is devastated and together we will rebuild. What I’m most impressed by is the spirit of the people of Faith Church. Despite the loss of the place of so many memories, no one wants to rebuild the past. We want to build a place for today and tomorrow’s ministry needs. What will that look like? We’ve got a lot of questions. It’s not reasonable to believe the insurance settlement will cover all real expenses incurred. What will we have to make up or do without? Faith Church has had a 30+ year dream to build Luther Village, a low-income senior housing complex on its back two acres. Is now the moment when that can happen? How do we use this transition moment to launch the next generation of mission for the congregation? Faith Church was founded as the center of the north suburbs of Tampa, but the interstate system pushed development much further out. Our neighborhood is now the no-man’s-land between the city and the county suburbs. It’s become one of the lowest per capita income areas in the county. What’s our mission in the neighborhood today? We started a community garden, we have a daycare, we’ve been working to develop a family resource center. Will the resource center come to fruition now or will it step to the back as we rebuild? And what if a developer eyes our prime corner lot of three acres? Tesla is setting up shop just down the street. Do we take the money and relocate – but where? The people of Faith Church have history in this place. I was vividly reminded of that history at a funeral I did this past month for a son of the congregation. With the loss of the sanctuary we had to use the funeral home. Our music director showed up only to discover there was no keyboard instrument at the facility, and we were left with using pre-recorded praise music. Yet the chapel was overflowing with friends and family who grew up with the deceased; some since the second grade. Most of them still live in the area, along with children and grandchildren. We celebrated the resurrection of Jesus Christ and the power of forgiveness to redeem and restore our life together. The proclaimed gospel released many from the weights upon their hearts and minds. Could it be that fire to the sanctuary has revived the fire for mission among us? I think so. But the thing about mission is it means quite literally “to be sent”. So what and where is the Holy Spirit sending the people of Faith Church? Ask that prayer with us, and may our hearts have faith to believe God’s hand is working something wonderfully new among us. We commit ourselves to becoming an expression of God’s realm in north Tampa – may God strengthen us for this journey.